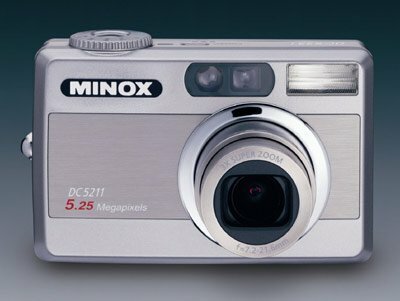 Minox DC5222 - digital camera with 5.2 Megapixels and an oversized 2.5 inch monitor. With their new DC 5222 digital camera, MINOX once again incorporates the latest compact digital camera technology and features while still retaining the company ethos of combining modern technology with the smallest functional design. An oversized 2.5” LCD monitor features prominently on the back of the camera and all controls sit comfortably on the camera and are easy to use. The camera has a 5.2 Megapixel CCD sensor and fast multi-coated MINOCTAR autofocus lens with macro feature. The 3x optical and 4x digital zoom offers the user plenty of freedom for everyday photography. The seven white balance and four flash modes combine to ensure correct exposure and true colour reproduction on images in numerous difficult lighting conditions. A fast image sequence and minimal shutter release delay allow spontaneous snapshots whatever the situation. The Minox DC 5222 will also record video clips of up to 30 seconds duration and can therefore also be used as a mini video camera. An unusually large LCD colour monitor measuring 2.5” allows easy viewing of the subject matter both before and immediately after the shot, and thanks to its brilliance and sharpness can also be easily viewed in bright lighting conditions. The USB interface of the MINOX DC 5222 allows for fast downloading of the image files to the computer. Using the supplied software, the images can be touched up on a computer if necessary and then printed or e-mailed to others. Handily compact dimensions of just 88.5mm x 24mm x 54.5mm and its sensible features make the Minox DC 5222 an ideal compact digital camera to take with you wherever you go.